This year's ACT results show 31 percent of students still unready for college in English, math, reading or science — every subject the assessment organization tests. That's a figure that has not changed since 2012, when it was slightly higher. Fewer than a fifth of those students can be expected to go on to earn a college degree within six years. The data comes from the 1.9 million tests taken by students who use the results either to graduate from high school (in 13 states) or to apply to college. And the results should serve as a "wake-up call for our nation." Those were the words from ACT CEO Jon Whitmore in a prepared statement. Whitmore noted that "The needle is barely moving on college and career readiness, and that means far too many young people will continue to struggle after they graduate from high school." The not-for-profit defines "readiness" as the state of having the skills and knowledge needed to enroll and succeed in for-credit courses in a college, university or other post-secondary school without remediation. The benchmarks are scores on the ACT tests that represent the level of achievement required for students to have at least a 50 percent chance of obtaining a B or higher or 75 percent chance of obtaining a C or higher in first-year college courses. The numbers are median course placement values that represent typical expectations as determined through a scientific sampling of institutions and students from across the country. This year, four in 10 graduates showed "strong readiness," which meant they met ACT benchmarks in at least three of the four subjects. That's a rate that has stayed virtually flat for the past five years. ACT's research has found that 60 percent of students who have met at least three benchmarks could be expected to earn a degree within six years. Only 28 percent of students passed all four college readiness benchmarks. ACT reported that the readiness levels are weakest among African American, American Indian, Hispanic and native Hawaiian/Pacific Islander minority groups. Asian students did the best in every subject. 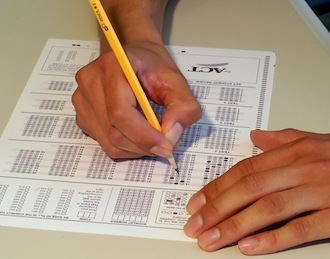 The worst composite score across all four subjects — 18.5 — was found in Hawaii, where 93 percent of graduates took the ACT tests; the best score, 24.3, was found in New Hampshire, where 23 percent of graduates were tested. "We simply must do better," said ACT President Jon Erickson. "It's time to step up our efforts to provide...all students with quality tools, skills and behaviors that prepare them for success." For all 2015 ACT test-takers, which represented about 59 percent of the entire United States graduating class, English was the subject where they showed the best college readiness; 64 percent of high school graduates met the benchmark. Reading came in at 46 percent; math stood at 42 percent; and science was 38 percent. In a nod to its own free ancillary service, ACT Profile, the organization encouraged families to put effort into planning and preparing for post-high school life. Profile, an online service in beta testing, allows the student to do planning self-assessments and then drill into information about specific schools, majors and careers. "Don't count on the system to keep you informed and aware of what you need to do," said Erickson. "That's the path that too many are following, and it's clearly not working. Take charge early in the student's educational career, learn what it takes to succeed and make sure you are getting what you need." Use data, but in a way that "balances the potential to help students improve with the responsibility to ensure students' privacy and confidentiality." ACT said in its report that it "stands ready to work with like-minded organizations to support systemic education reforms." The report, "The Condition of College & Career Readiness 2015," is available on the ACT site. National and state readiness reports are available at act.org.